Researcher Dr. Jeroen de Vries from the University of Twente MESA+ Institute for Nanotechnology suggests we could store data for one million to one billion years, using a new storage medium based on tungsten and graphene oxide. We need to create a legacy for future intelligent life that evolves on Earth or comes from other worlds. de Vries has developed a novel optical-disc information carrier that he says can store such information for extremely long periods of time, using etching techniques. 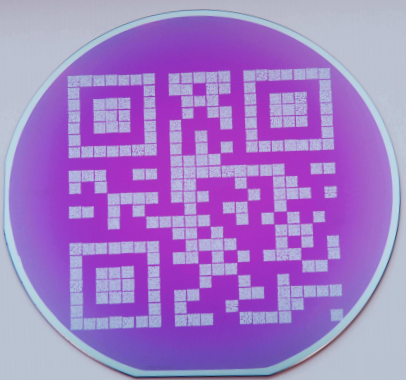 A wafer consisting of tungsten (which can withstand extreme temperatures, up to 3,422 degrees C and has a low thermal expansion coefficient) is protected by being encapsulated in silicon nitride (has a high resistance to fracture and a low thermal expansion coefficient). To prove that the data would still be readable after millions of years, de Vries did an aging test to see if the energy barriers are high enough to prevent data loss. After the test there was no visible degradation of the tungsten, and it was still easy to read the information. However, things become complicated at higher temperatures. When heated to 713 Kelvin (440 degrees Celsius) it becomes a lot more difficult to decipher the QR codes even if the tungsten is not affected. But what about physical damage, such as from a meteorite or earthquake? For that purpose, Swinburne University of Technology researchers have proposed a different coding system and substrate: holographic coding in a graphene oxide polymer composite, as described in a research paper published in Scientific Reports (open access). “Conventionally, information is recorded as binary data in a disc. If the disc is broken, the information cannot be retrieved,” Director of the Centre for Micro-Photonics at Swinburne, Professor Min Gu, said. Graphene oxide has properties similar to graphene, which is very strong, light, flexible, nearly transparent, and is an excellent conductor of heat and electricity, but also has a fluorescent property that can be used in bioimaging and for multimode optical recording. 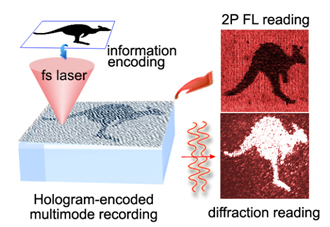 To demonstrate the feasibility of the mechanism, the researchers encoded the image of a kangaroo in a computer generated hologram. The hologram was then rendered as a three-dimensional recording to the graphene oxide polymer. The encrypted patterns in the hologram could not be seen with a conventional microscope, but could be retrieved in the diffracted mode. “This exciting feature also helps to reduce the operation costs of big data centers that rely on multiple physical duplicates to avoid data loss.” The researchers say it could also revolutionize flat screen TV and solar cell technology. “It is projected that the new technique will enable new storage discs to be available in market within the next 3 to 5 years,” Gu told KurzweilAI. This technique could also be used for anti-counterfeit holographic tags, using with earth-abundant and environment-friendly materials, he said. Special Issue "Human Document Project"